Amazon Price: $219.00 $135.00 You save: $84.00 (38%). (as of April 25, 2019 9:54 pm – Details). Product prices and availability are accurate as of the date/time indicated and are subject to change. Any price and availability information displayed on the Amazon site at the time of purchase will apply to the purchase of this product. 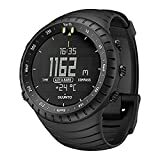 Building on the success of the venerable Suunto Vector, the Suunto Core keeps you informed of conditions while you hike, bike, or camp, making it a terrific companion for outdoor enthusiasts of all stripes. What can the Suunto Core do for you? For starters, it can sense an approaching squall even when the sky looks clear. This intelligent Storm Alarm–one of several intelligent features designed to keep you safe and secure–is activated by a rapid drop in air pressure over a three-hour period. Once the Core senses the change, the Storm Alarm sounds and flashes, letting you know that something unpleasant is fast approaching. The built-in altimeter, meanwhile, displays your current elevation, shows how much you've climbed or descended, and records your entire session for later analysis. Accurate to within 30,000 feet, the altimeter is an extremely valuable tool for mountaineering, backcountry skiing, and wilderness travel. Add in such additional features as a barometer, a digital thermometer, a weather trend indicator, and a digital compass and you have a terrific wrist-top computer for almost all your outdoor needs.